This Saturday I’ll be flying off to present the co-authored paper, Dynamic Visualization of Quality in Online Conversations in Santiago Chile at the 2018 IEEE/WIC/ACM International Conference on Web Intelligence. I’m very excited to present this research because it was a truly collaborative effort with 3 undergraduate students and my long-time collaborative Dr. Evren Eryilmaz. Below is the abstract and tagcloud of the paper. Abstract— This paper reports on software designed to visualize levels of quality within online conversational media. Prior to construction, data mining was performed on 2,157 online conversations and examined for attributes of quality. This initial dataset was analyzed for lexical complexity and prompt-specific vocabulary usage and helped guide the redesign of an existing asynchronous online discussion board (AOD). 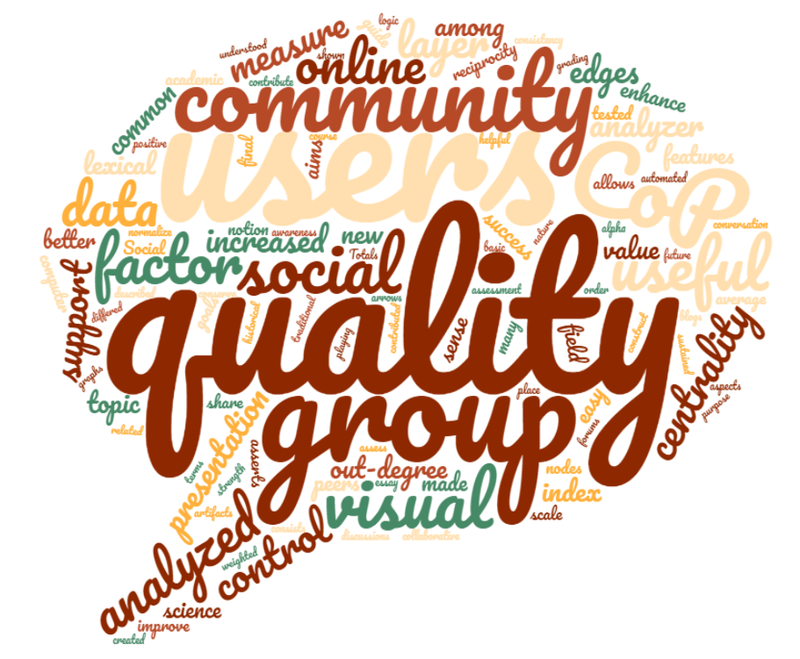 The new design incorporates a real-time quality analyzer and provides users with a visual breakdown of their post in relation to the overall group discussion thread. Results found that the proposed system produced higher levels of overall quality in discussion posts and increased interactions with higher quality discussion posts. Survey results and a social network analysis (SNA) indicate that the proposed system produced higher levels of system satisfaction and group cohesion when compared against control software. B. Thoms, E. Eryilmaz, N. Dubin, R. Hernandez, S. Colon-Cerezo. “Dynamic Visualization of Quality in Online Conversations,” Accepted for inclusion in Proceedings of 2018 IEEE/WIC/ACM International Conference on Web Intelligence, December 3-6, 2018, Santiago, Chile.